The Raycop™ Ultraviolet Vacuum utilizes the power of UV-C light to destroy dust mites, bacteria, viruses and allergens. Oreck Halo is the only upright light weight commercial vacuum cleaner that not only removes dirt and dust but also kills germs. The Oreck Halo uses a patented ultraviolet UV-C light chamber technology tested and proven to destroy and remove many common microbes from all floor types, rugs, carpeting, tile, and hardwood flooring. 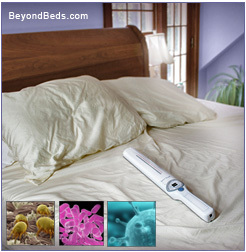 The Verilux® UVC Sanitizing Wand is a state of the art home disinfecting tool that safely eliminates germs, dust mites, and other micro-organisms from bedding and household surfaces without the use of harmful chemicals. Designed to eradicate allergens, viruses, fungus, mold spores bacteria and odors,the Verilux® UVC Sanitizing Wand applies the same technology used to disinfect drinking water and sanitize hospitals to the invisible sources of contaminants in your home. This revolutionary handheld home appliance converts ordinary tap water into ionized water that works as a powerful cleaning solution. It is ideal for cleaning and sanitizing cribs, high chairs, toys, pet bowls, litter boxes, sinks, toilets, bathroom showers/tubs, kitchen appliances, steel, chrome, granite, marble, natural stone, plastics, fabrics, carpet, car/truck exteriors/interiors, as the HOM kills more than 99.9% of harmful bacteria and viruses, if used as directed. It works great on glass, windows, mirrors and countertops, as the ionized water does not spot, streak or leave a chemical residue like many chemical cleaning products.